Apple wins the race… first U.S. company to a $1 trillion market cap. Inspired by strong quarterly earnings, Apple ran down favored Amazon in the final turn… and broke the tape yesterday morning. “Apple Officially Becomes First U.S. Company With $1 Trillion Market Cap,” MarketWatch thundered. “Apple Makes History by Becoming First U.S. Company to Reach $1 Trillion,” cheered USA Today. 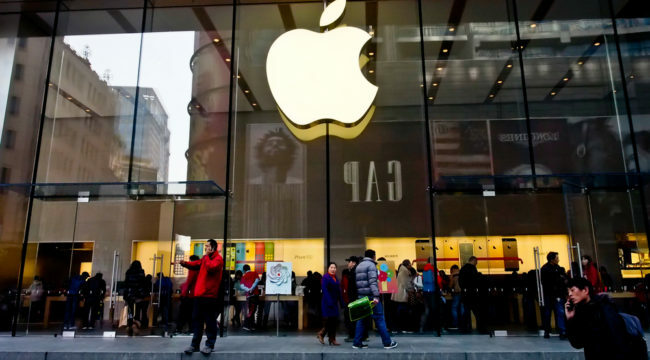 “Apple Reaches $1000000000000 Value,” came joyous word from CNN. Yesterday most likely represented “Peak Apple”… and it’s probably downhill from here. Market analyst Mark Hulbert has identified the S&P’s leading stock by market cap each year since 1980. He then compared its subsequent annual performance to the S&P as a whole. The roster of faded glory includes former kingpins as IBM… Microsoft… General Electric. Will Apple face down these odds? Apple is not the world’s first trillion-dollar concern, incidentally. That honor falls to PetroChina, which excelled that gorgeous number after its 2007 IPO — and subsequently hemorrhaged $800 billion over the ensuing decade. We do not project a similar collapse for Apple. We expect rather a gradual yielding, a slow-motion arson, a dying by centimeters and inches. Next year’s iPhone is not in jeopardy. Like much of the stock market itself, Apple’s milestone is rigged… ersatz… fake news. Its victory arrives in part through the dark divinities of modern finance — stock buybacks. The Fed’s ultra-low interest rates have enabled corporations to borrow vast amounts at next to zero cost. With this debt many have purchased their own stock at an unprecedented gallop. First-quarter buybacks totaled $242 billion — a record. Second-quarter buybacks doubled that record — to $433.6 billion, according to research firm TrimTabs. These buybacks reduce shares outstanding… increase earnings per share… and lift the stock price. 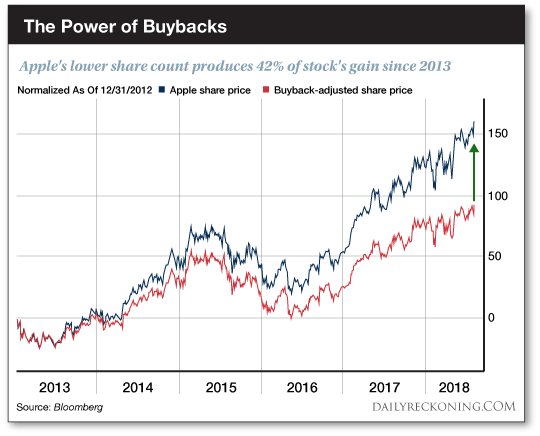 And Apple is king of buybacks. Through the year’s first six months, Apple has purchased over $43 billion worth of its own stock. That is the largest amount of buybacks in history, according to Howard Silverblatt, senior analyst with S&P Dow Jones Indices. Is it a wonder why Apple stock has risen 16% this year… while the S&P is up a mere 5% for 2018? But how do these buybacks relate to Apple’s record $1 trillion market cap? A company’s market cap is calculated by multiplying its number of outstanding shares by its stock price. Apple had over 4.8 billion shares outstanding as of July 20 — according to the most recent data. Based on that figure Apple’s stock needed to strike $207.05 per share to excel $1 trillion. Buoyed by a positive earnings report, Apple stock attained that mark yesterday morning — $207.05. And so, with its thumb heavily on the scale… Apple becomes the first U.S. corporation to $1 trillion. Every dollar sunk in buybacks is a dollar unspent on expanding the business… equipment… research and development. Comes a point when the cheap credit dries up… and buybacks no longer pay. At that point a business must justify its market cap through higher productivity — not parlor tricks. Wouldn’t Apple’s long-term interests be better served by spending on R&D instead of buybacks? The “next big thing” is out there, awaiting discovery. And if Apple doesn’t unearth it… someone else will. The one constant in this world of markets and men… is change. Today’s first violin is tomorrow’s second fiddle. And vice versa. So it is in business. So it is with nations… and empires. Athens had led a coalition of Greek city-states that defeated Persian invaders, and emerged undisputed leader of the Hellenic world. The United States is not the first power in history to spread democracy abroad. Yet in time Athens grew arrogant. Its former allies began seeking a balancing counterweight. The 27-year Peloponnesian War that followed ultimately took Athens to its knees… and the Golden Age was no more. Rome’s market cap attained zenith in the second century (A.D.), under the emperor Trajan. Roman power covered Britain in the northwest, Mesopotamia in the east, North Africa in the south — and all points in between. To what city did all roads lead? But the civilizational sinews ultimately weakened… a corrupting rot seeped into the marrows… and Rome began losing market cap. Barbarians ultimately breached the walls and sacked the place, wondering what the toilets were for. The British Empire, on which the sun never set — and on which the blood never dried — reached peak market cap in 1914, before the Great War. It would never reclaim it. The Soviet Empire saw its market cap peak in the 1970s — then collapse to zero on Christmas Day, 1991. Which brings us to these United States. What about its market cap? We estimate America reached peak market cap during the 1990s. It was the lone remaining superpower. America bestrode the world like an overtowering Colossus… and all the world’s divergent rays converged upon the new Rome. But history began anew on Sept. 11, 2001. In Afghanistan — the graveyard of empires — in Iraq, Libya, Syria and elsewhere. America’s mission civilisatrice to spread the democracy the world over now appears a bankrupt currency. Who really believes in it anymore? As the Greek city-states sought to counter Athenian power, many of today’s powers seek alternatives to American power. Perhaps China is the new Sparta to the American Athens — as the Soviet Union was before. But like Apple, America will not lose its market share tomorrow or the day after. It is too big, too rich, too powerful — too American. And no one power is ready to take its place affront the table. But the trend… the trend. And America as the indispensable nation?